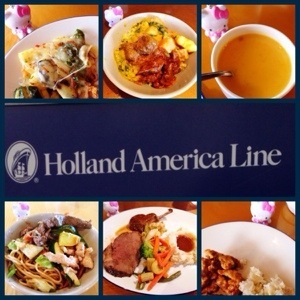 Hello Lido Restaurant @ Holland America ms Zuiderdam! 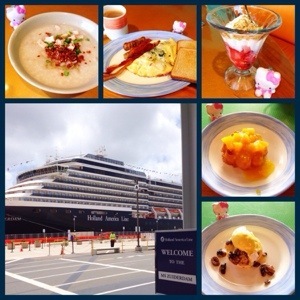 I recently came from four day cruise to Vancouver, Canada aboard Holland America’s ms Zuiderdam ship. Upon first entry on the ship, I noticed right away that several of the travelers would always go off the 9th deck of the ship. I soon found out that this was because the ninth deck is the Lido Deck where the Lido Restaurant is located. From breakfast to dinner, the Lido restaurant offers abundant variety of food choices buffet style. It has been said that breakfast is the most important meal of the day and at the Lido Restuarant, vacationers have their pick of a variety of hearty breakfasts. They have Asian style rice porridges where toppings include chicken, beef, tofu, onion and garlic. For egg fans, they had a variety of egg-licious choices such as customized omeletes and different eggs benedicts from around the world. For a sweeter start of the day, breakfast offerings included yogurt parfaits and waffles topped with fruits. The main courses for Lido Restaurant rotated around different entrees from around the world. Some food dishes during our trip included classic French quiches, Indian vegetable curry, beef vindaloo and lamb kafta, turka dhal and Japanese fried rice and udon. Dessert at the Lido Restaurant was always abundant. 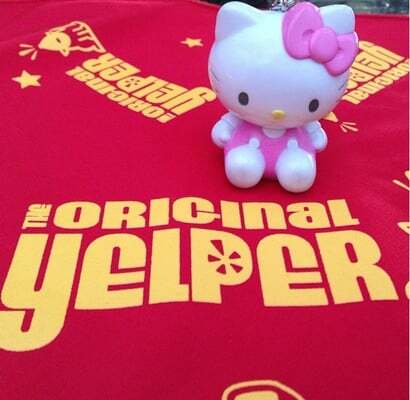 From cheesecakes, cupcakes and various cakes, there was something sweet for everyone. Ice cream flavors rotated daily with traditional flavors like vanilla to unique flavors like cactus. 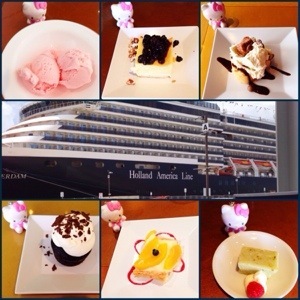 Hello Vista Dining Room @ Holland America ms Zuiderdam!